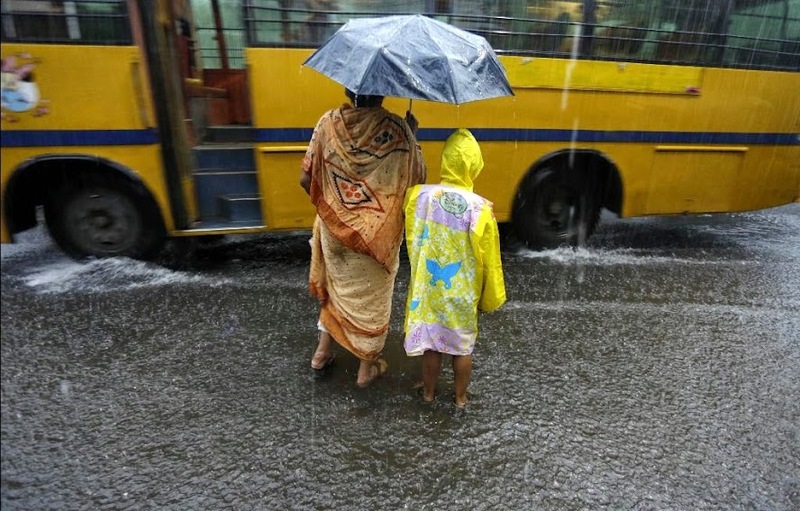 A woman accompanies a child home from school in the rain in Kolkata, India, Wednesday, July 2, 2014. Normal traffic was affected in several areas of the city because of overnight rainfall that caused water-logging, according to news reports. 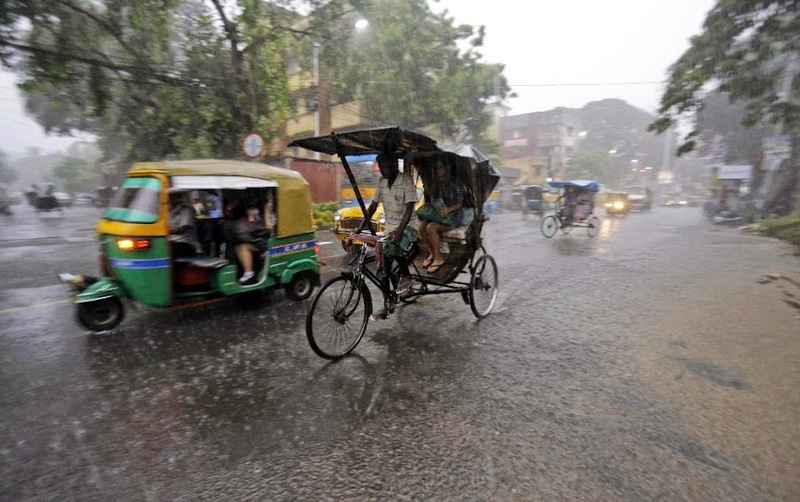 A rickshaw driver transports a passenger in the rain in Kolkata, India, Wednesday, July 2, 2014. Normal traffic was affected in several areas of the city because of overnight rainfall that caused water-logging, according to news reports. Indians cover themselves with a plastic sheet as it rains in New Delhi, India, Wednesday, July 2, 2014. According to the weather office, the monsoon rains are expected to hit the national capital in the next few days. Indians play soccer in the rain, by the shores of the Arabian Sea in Mumbai, India, Wednesday, July 2, 2014. Heavy rains lashed the city, disrupting traffic and causing waterlogging in several areas. Indian school children look out a window of a school bus as it rains in Mumbai, India, Wednesday, July 2, 2014. Heavy rains lashed the city, disrupting traffic and causing waterlogging in several areas. Indian schoolgirls share an umbrella in the rain in Mumbai, India, Wednesday, July 2, 2014. Heavy rains lashed the city, disrupting traffic and causing waterlogging in several areas. A man rides a bicycle with two children returning from school as it rains in New Delhi, India, Wednesday, July 2, 2014. According to the weather office, the monsoon rains are expected to arrive at the national capital in a couple of days. A youth dives into water as it rains in New Delhi, India, Wednesday, July 2, 2014. According to the weather office, the monsoon rains are expected to arrive at the national capital in a couple of days. An Indian covers himself with a plastic sheet as it rains in New Delhi, India, Wednesday, July 2, 2014. According to the weather office, the monsoon rains are expected to hit the national capital in the next few days. Indians cover themselves with plastic sheets as it rains in New Delhi, India, Wednesday, July 2, 2014. According to the weather office, the monsoon rains are expected to hit the national capital in the next few days. An Indian school boy jumps over a puddle of water as it rains in Mumbai, India, Wednesday, July 2, 2014. Heavy rains lashed the city, disrupting traffic and causing waterlogging in several areas.